Your first consultation with the Bicycle Repairman is FREE! You will determine what you want to learn and how many sessions you want to schedule. All bicycle repair tutoring takes place at David’s fully-equipped and comfortable workshop in Northeast Portland. Your lessons will be one-on-one to maximize your learning experience, and you will come away a master of your bicycle. 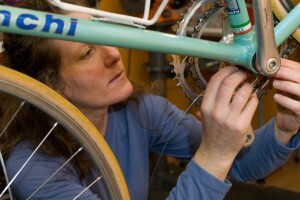 The Bicycle Repairman can also be booked to tutor couples, families, and groups. Cost: $40/hr. and sliding scale for persons on fixed or limited income.